Jayne Auld Manor rendering by ZBA Architects. As the government shutdown continues into its second month, it's becoming clear that thousands of Inland Northwest families could be put in a precarious housing situation if federal funding isn't provided by March. 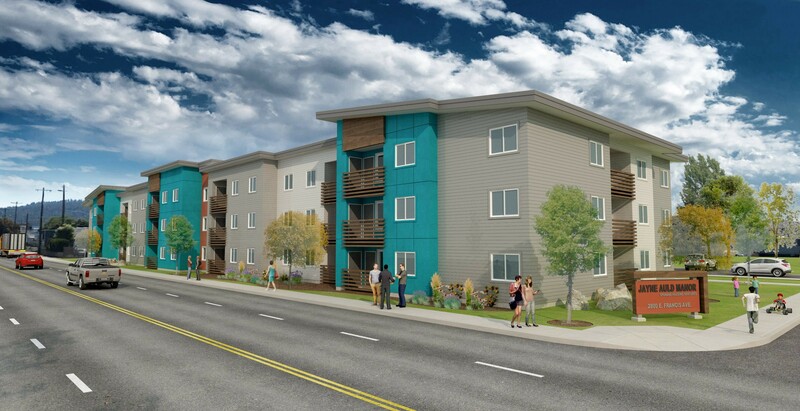 Spokane Housing Authority manages federal housing vouchers that cover an average of $435 per month for utilities and rent, helping about 14,000 people across six counties in Eastern Washington, says Pam Tietz, the authority's executive director. While housing choice vouchers are funded through February, if March payments don't come in, tenants in those 5,200 households will have to hope that their landlords will be understanding. Typically, those tenants pay 30 percent of their income for rent and utilities, with the authority's payment covering the remainder, Tietz says. Housing authority staff will evaluate the shutdown situation the first week of February, she says, and they could send letters to every tenant and landlord asking them to work together to avoid evictions or other issues. "We will urge our landlords to be patient and to not evict people for the lack of housing assistance payments after the first of March," Tietz says. "We're relatively certain that once the government shutdown is ended, all of that will be funded and we'll go back and pay our landlords what they're due." Meanwhile, other housing subsidies for low-income housing projects could also be impacted come March, leaving property owners without operating budgets to pay utilities, complete maintenance, and more. Some projects are also on hold: Spokane Housing Ventures, a nonprofit that owns and manages 36 housing properties across Washington, has been trying to obtain a 48-unit apartment complex to create additional senior housing in Medical Lake for years, says Fred Peck, the nonprofit's executive director. Just as all the funding and paperwork was getting lined up in time for the property to get signed over, the shutdown started, Peck says. "We had high hopes of closing in late December," Peck says, "but the project is on hold because the USDA staff in the Department of Rural Development are considered nonessential and have been off work since late December."